Notifications on your Mac keep you informed about the events happening around you when you are busy doing something on you Mac. It notifies you about everything from new emails to a new ‘like’ or “comment” on your latest Facebook post. It is very convenient to get notified about everything happening around you without leaving your important work and logging in to a different website. 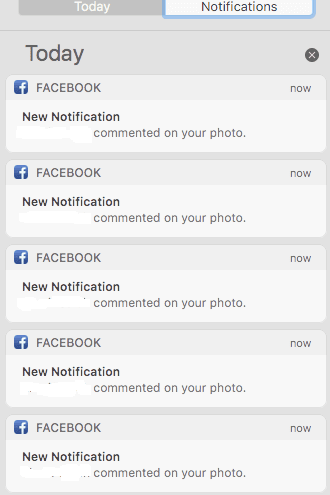 But think of a situation where you receive more than 100 notification of 1 single Facebook comment, how frustrating and annoying it could be. You won’t believe that I also got caught up in such a situation where I was getting 80 repeated gmail notification of just one single email from my friend. These repeated or duplicate notifications may be associated with any website, service or app. I tried a lot of troubleshooting steps for fixing this issue myself and finally found a fix which I will explain to you in this post. So if the notification center on your Mac displays same message multiple times then just follow the steps mentioned in later part of this post to fix it. Some users have reported that this problem started after upgrading to macOS Sierra but let me tell you that, this issue has been around for more that 4 years now and occurs on every Mac OS X version. You may get multiple duplicate notifications from Facebook, Twitter, Gmail or Calendar appointments. This exact same problem also occurred with Gmail app for iOS way back in 2012 which Google fixed by updating the Gmail app for iOS. Google had identified this as a bug with the Gmail app that if you read a message in webmail on your Mac that message is still tagged as unread on iOS app and the notification is not cleared from iOS resulting in generation of multiple copy of the same notification. What I believe is that, it is not an issue with the app anymore but an error connecting with the server which causes those duplicate notifications. You receive multiple copy of same notification as a banner along the right edge of your Mac. You get multiple notification for every 1 single Facebook “like” or “comment”. You see more than 10 notification for every single new email. You can not dismiss or clear the notification as it comes back again. In order to fix this multiple duplicate notification issue you need to follow all the step mentioned below in the order they are written. Click on the Apple logo at the top left corner and select System Preferences. Choose Notification and Select the problematic account like Facebook, Gmail or Twitter on the left. Uncheck the boxes for “Show notification on lock screen” and “Show in notification Center” on the right. Select the Alert Style to None. Close the System Preferences window and jump to Step 2. Go to System preferences > Internet Accounts. Select the service like Facebook or Twitter on the left. Uncheck the box for Notifications on the right and click the “-” button at the bottom left side to remove the service. If you have any App installed for these accounts then go to /Application/ Folder in Finder and move the App to Trash as well. Open Keychain Utility and look for any entry named Facebook or Prefixed with Facebook or Twitter in case of receiving multiple notification from Twitter. Delete the associated entry and close the Keychain utility. Click on the “Go” menu in Finder and Select “Go To Folder…” and type ~/Library and select Go. Open Preferences folder and delete the following files. Resetting SMC is a simple task of holding CTRL+Shift+Option key together during start up but iMac and MacBook with removable battery has a different way to reset SMC. Read the post on How to Reset SMC for details. 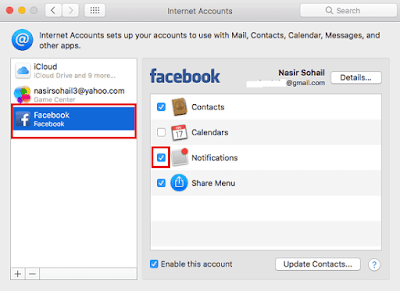 Log on to Facebook in Safari, and do not enable Apple OS integration when asked. Go to Settings from top right drop down arrow sign. Click end activity for all active sessions here. Clear History from Safari and restart your Mac. Log on to Gmail in Safari and do not enable Account integration with macOS when asked. In the bottom right, click Details and a new pop up window will appear. Click Sign out all other web sessions. Log on to Gmail or Facebook in Safari and Enable account integration with macOS when asked. You’r now ready to receive notification and the multiple duplicate notifications issue will be fixed. 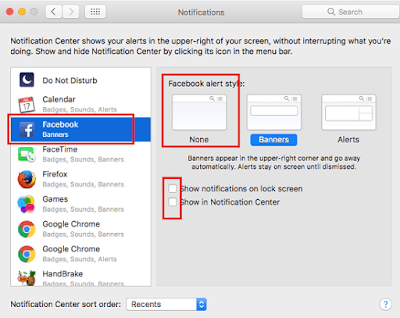 That was all about the troubleshooting steps to fix repeated notification of same message in notification center on your Mac. If you are also facing this problem let us know if the above steps helped you fixing it. Previous articleHow to turn off Cross-Site Tracking in Safari for macOS High Sierra? Next articleHow to Hide or Turn Off Comments on a per webpage basis?